Spectacular lithograph on paper signed by the important Native American artist Tommy Wayne (“T.C.”) Cannon (1946-1978), titled Waiting for the Bus, Andarko Princess ($12,500). Large, historical and possibly ancient cooking basket, 15 inches in diameter, not ceremonial, used for everyday cooking, found in northwest Nevada 50 years ago, never buried ($3,125). Large, circa 1900-1910 Mono basket, 19 ½ inches tall, intended for utility or cooking but never used and probably made for sale to the Anglo market, displaying zig-zag patterns ($2,625). 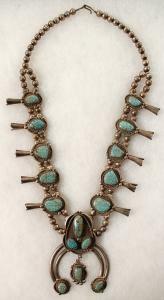 Outstanding vintage Navajo Squash Blossom necklace boasting 16 beautiful turquoise nuggets from the #8 mine in Eureka county, Nevada ($2,500). 1884 stock certificate for the Harmony Borax Mining Company (Death Valley, Calif.), early #23 for 18 shares, issued to a Mr. William T. Coleman, with signatures ($2,500). The Wigwam Auction – a celebration of the country’s Great Basin Native American heritage – was held by Holabird Western Americana Collections in Reno, Nevada. 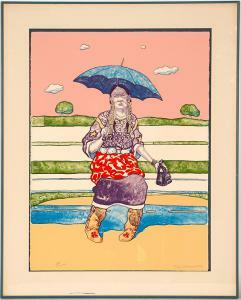 RENO, NV, UNITED STATES, March 28, 2019 /EINPresswire.com/ — A spectacular lithograph on paper signed by the important Native American artist Tommy Wayne (“T.C.”) Cannon (1946-1978), titled Waiting for the Bus, Andarko Princess, sold for $12,500 at a five-day Wigwam Auction – a celebration of the country’s Great Basin Native American heritage – held March 7th-11th by Holabird Western Americana Collections in Reno. The auction was conducted in Holabird’s gallery located at 3555 Airway Drive (Suite #308) in Reno, as well as online via iCollector.com and Invaluable.com. Headlining the event was the Moe and Mary Royels Great Basin Wigwam Collection. The items in the Royels’ collections reflect the rich history the state of Nevada enjoys in the unique place known as the Great Basin. 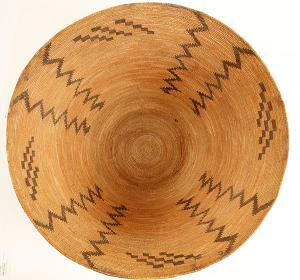 The Wigwam Collection is a fantastic array of Native American collectibles, art and artifacts. A number of items (mainly dresses) were made especially for Mary Royels, plus a few for Moe, by local Paiute friends. The collections included baby baskets, beaded baskets, art depicting early man in the Great Basin by William Moore, stone artifacts, moccasins and stone projectile points. The T.C. Cannon litho, from 1978, was the auction’s top lot. Depicting a woman seated on a bench waiting for a bus, it was signed, numbered (#24/125) and embossed by the artist. The print was housed in a double mat frame, 37 inches by 30 inches. Another litho of the same work is on display at the Smithsonian Institute. Cannon, from Oklahoma, was a member of the Kiowa Tribe. Day 1, on Thursday, March 7th, featured rare vintage bottles (165 lots); saloon items (9 lots); cowboy collectibles (34 lots); firearms and weaponry (26 lots); gaming collectibles (10 lots); and numismatic items, to include books, checks, coins, dies, ephemera, medals, “so-called” dollars, tokens and more. Over 500 lots – a full auction by itself – crossed the auction block on Day 1. Day 2, March 8th, was packed with 550 lots of Americana, to include advertising, art, books and directories, calendars, Gold Rush, postal history, militaria, political lots, Wells Fargo & Express, silverware, flatware, non-mining stock certificates, toys and World’s Fair. A group of ten orange Republic of China 6% two-year secured gold loan treasury notes from 1919 gaveled for $6,562. Day 3, March 9th, contained Part 1 of the Native Americana, to include artwork, apparel, gloves, moccasins, accessories, jewelry, trade beads, artifacts, pipes, dies and baby baskets. Also sold that day were 52 lots of artwork (including the T.C. Cannon litho), for a grand total of 604 lots. Day 3 included an outstanding vintage Navajo Squash Blossom necklace boasting 16 beautiful turquoise nuggets from the #8 mine in Eureka county, Nevada ($2,500); and a high-quality serigraph by Franz Scholder, titled Indian with a Gun, #49/80, artist signed and 22 inches by 33 inches ($1,875). Scholder’s artwork is distinctive, colorful and very popular among collectors. Day 4, on Sunday, March 10th, featured Part 2 of the Native Americana, to include pottery, baskets, dolls, books, photographs, postcards, rugs and weavings, ephemera and collectibles. Also offered were transportation (244 lots) and railroadiana (184 lots) – 301 total lots in all. Day 4 featured a large, historical and possibly ancient cooking basket, 15 inches in diameter, not ceremonial, used for everyday cooking, found in northwest Nevada 50 years ago, never buried ($3,125); and a hand-woven Navajo rug with a tribal design, 39 ½ inches by 44 inches, made by America’s Natives from the Russell Foutz Indian Room in Farmington, New Mexico ($2,875). A collection of 40 red Imperial Chinese government railway 100-pound bonds, issued in 1911 by the Hong Kong & Shanghai Banking Corp. in London, hammered for $2,625. Also, an unissued, unsigned and uncancelled first mortgage 10% gold loan in the amount of $500 for the Gilpin County (Colo.) Tram Railway Co., with all ten coupons, printed circa 1871-1873, made $1,625. A large, circa 1900-1910 Mono basket, 19 ½ inches tall, intended for utility or cooking but never used and probably made for sale to the Anglo market, displaying zig-zag patterns and classic Paiute four bi-symmetric starts, achieved $2,625; and a historic and possibly ancient flat cooking basket, 25 inches in diameter, possibly from Steamboat or McDermott (N.D.) realized $1,875. 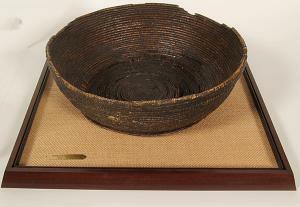 A large, circa 1900 winnowing basket, 28 ½ inches long by 21 ½ inches wide, with open basket twining, utilitarian (but never utilized), a pine nut harvest relic from the Great Basin, finished at $1,750. Also, a camp-size, vintage Washoe water pack basket “Tus” in a sacred red ochre color, 20 inches tall, 12 inches diameter, with close twined willow and hemp handles, reached $2,000. Top lots from Day 5 included a lavish hardcover prospectus ad accompanying map for the Keystone Silver Mining Company in Reese River, Nevada, from 1865, in pristine condition ($2,000); and an 1884 stock certificate for the Harmony Borax Mining Company (Death Valley, Calif.), early #23 for 18 shares, issued to a Mr. William T. Coleman, with signatures ($2,500). Holabird Western Americana is always seeking quality bottle, advertising, Americana and coin consignments for future auctions. To consign a single piece or a collection, call Fred Holabird at 775-851-1859 or 844-492-2766; or, you can e-mail him at fredholabird@gmail.com. To learn more about Holabird Western Americana and the firm’s upcoming events, please visit www.fhwac.com.